It was really good. 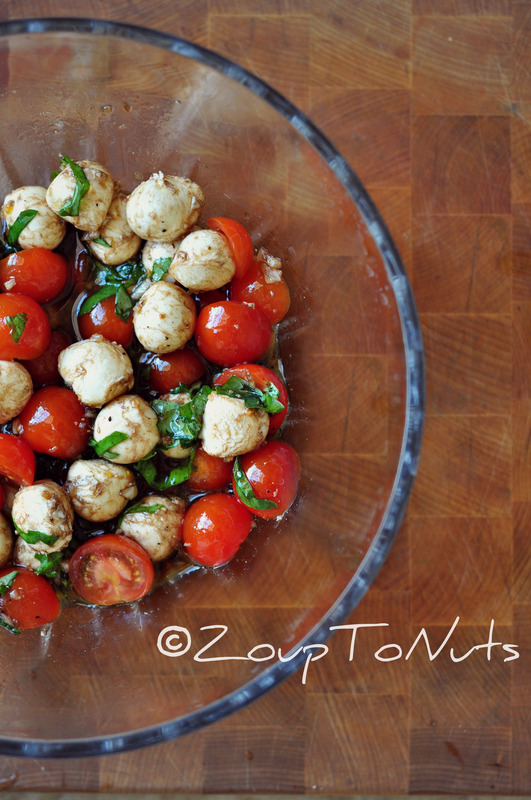 Different from Caprese with the onion and garlic, but with a nice kick. I thought about reducing the balsamic, but I was too lazy!! 🙂 Did Ava and your mom get home safely?? Made this 2 weeks ago and making it again tonight. Tasted excellent! I threw my leftovers on top of cold pasta and was a delicious side to dinner the next night as well. Show another Salad that has tomatos but not the stuff you Put in the salad now from Email you sent. This was gross. The beautiful white mozzarella turned brown and my guest asked if it was tofu. In this case, I think the Italians know best. Alex, perhaps you haven’t cooked with balsamic vinegar before. It is a dark color because it’s been simmered for hours and caramelizes. If you would like to retain the beautiful white color of the mozzarella, grocery stores carry white balsamic that has been simmered at a much lower temperature to avoid darkening. Perhaps you try it again with that approach. It really is quite delicious. Good luck. Is this okay overnight or should it be made closer to when you are going to eat it? This is SO GOOD! I will, doubtless, be making this salad all summer. I added some orecchiette pasta and it was/is delicious. Very good as leftovers, even a few days later, as well. Thank you!! !